Concern about the impact of air pollution has led governments and local authorities across the world to regulate, among other things, the burning of fossil fuels, industrial effluence, cigarette smoke, and aerosols. This legislation has often followed dramatic findings about the impact of pollution on human health. At the same time there have been significant developments in our ability to detect and quantify pollutants and a proliferation of urban and rural air pollution networks to monitor levels of atmospheric contamination. Air Pollution and Health is the first fully comprehensive and current account of air pollution science and it impact on human health. It ranges in scope from meteorology, atmospheric chemistry, and particle physics to the causes and scope of allergic reactions and respiratory, cardiovascular, and related disorders. The book has substantial international coverage and includes sections on cost implications, risk assessment, regulation, standards, and information networks. 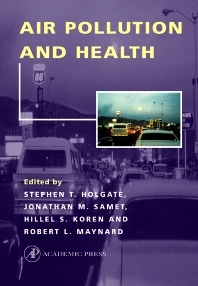 The multidisciplinary approach and the wide range of issues covered makes this an essential book for all concerned with monitoring and regulating air pollution as well as those concerned with its impact on human health. Postgraduate, postdoctoral, and senior researchers in asthma, cardiology, pulmonary/respiratory topics, and pollution; epidemiologists; public health specialists; and medical practitioners. Introduction, D.V. Bates. Air Pollution and Health History, P. Brimblecombe. Geographical, Atmospheric and Ground Determinants of Air Pollution: Basic Meterology, G.R. McGregor. Atmospheric Chemistry, R.G. Derwent. Measurements of Concentrations of Air Pollutants, R.M. Harrison. Patterns of Air Pollution in Developing Countries, M. Krzyzanowski and D. Schwella. Sources of Air Pollution, C. Holman. Exposure Assessment, H. Ozkaynak. Respiratory Tract Determinants of Air Pollution Effects: Animal Models to Study for Pollutant Effects, U.P. Kodavantri and D.L. Costa. Novel Approaches to Study Nasal Responses to Air Pollution, L. Calderon-Garciduenas, T.L. Noah and H.S. Koren. Effects of Cigarette Smoke and Air Pollutants on the Lower Respiratory Tract, P.K. Jeffrey. Structure-Function Relationships, P.A. Bromberg. Deposition and Clearance of Inhaled Particles, W.M. Foster. Respiratory Reflexes, J. Widdicombe. Antioxidant Defences in the Extracellular Compartment of the Human Lung, F.J. Kelly and R. Richards. Air Pollutants: Modulators of Pulmonary Host Resistance Against Infection, P.T. Thomas and J.T. Zelikoff. Carcinogenic Responses to Air Pollutants, R.O. McClellan and T.E. Jackson. General Methodological Agents of Air Pollutant Health Effects: Biomarkers of Exposure, M.C. Madden and J.E. Gallagher. The Epidemiological Approach to Investigating Outdoor Air Pollution, J.M. Samet and J.J.K. Jaakkola. Health Effects of Air Pollution Episodes, H.R. Anderson. Ozone: Epidemiological Studies of Ozone Exposure Effects, G.D. Thurston and K. Ito. Controlled Exposure to Ozone, Nitrogen Oxides and Acids, M.J. Hazucha. Acute and Chronic Effects of Ozone in Animal Models, R.C. Paige and C.G. Plopper. Oxides of Nitrogen and Sulfur: Epidemiological Effects of Oxides of Nitrogen, Especially NO2, U. Ackermann-Liebrich and R. Rapp. Toxicology of Sulfur Oxides, R.B. Schleisinger. Acid Sulfate Aerosols and Health, F.E. Speizer. Suspended Particulates: Composition of Air Pollution Particles, F.D. Pooley and M. Milne. Metals and Air Pollution Particles, A.J. Ghio and J.M. Samet. Particulate Air Pollution: Injurious and Protective Mechanisms in the Lungs, W. MacNee and K. Donaldson. Epidemiology of Particle Effects, C.A. Pope III and D.W. Dockery. The Health Effects of Diesel Exhaust: Laboratory and Epidemiologic Studies, A.J. Cohen and K. Nikula. Carbon Monoxide, Lead and Air Toxics: Carbon Monoxide, R.L. Maynard and R. Waller. Lead, A. Wadge. Selected Organic Chemicals, L. Rushton and K. Cameron. Estimating Health and Cost Impacts: Air Pollution and Lung Cancer, J.M. Samet and A.J. Cohen. Controlled Exposures of Asthmatics to Air Pollutants, D.B. Peden. Risk Assessment and Air Pollution, J.M. Samet. Estimating the Effects of Air Pollutants on the Population: Human Health Benefits of Sulfate Aerosol Reductions Under Title IV of the 1990 Clean Air Act Amendment, B.D. Ostro, L.G. Chestnut, D.M. Mills, and A.M. Watkins. Costing the Health Effects of Poor Air Quality, D. Maddison and D. Pearce. Air Quality Standards and Information Networks: Technology and Costing of Air Pollution Abatement, W.F. Dimmick and A.H. Wehe. United States and International Approaches to Establishing Air Standards and Guidelines, L.D. Grant, C.R. Shoaf and J.M. Davis. Air Quality Guidelines and Standards, M. Lippman and R.L. Maynard. Informing the Public about Air Pollution, R.L. Maynard and S.M. Coster. Index. Dr. Hillel S. Koren is the Director of the Human Studies Division of the National Health & Environmental Effects Laboratory in Research Triangle Park, North Carolina. National Health & Environmental Effects Laboratory, Research Triangle Park, North Carolina, U.S.A.
Jonathan M. Samet is the Chair of the Department of Epidemiology for the School of Hygiene & Public Health at Johns Hopkins University in Baltimore, Maryland. John Hopkins University, Baltimore, Maryland, U.S.A.